Browse to the location where the GAUSS installer was downloaded (usually your Downloads folder). Unzip the GAUSS_19_Win_64.zip (or GAUSS_19_Win_32.zip) file and double-click on the installer file. During the installation process, there is a box that says "Install for Everyone". Please check that box. Note: GAUSS 19 must be installed in a location in which the user has read and write privileges, typically c:\gauss19. At the end of the installation process, Notepad will open a file named myhostid.txt. The final line of this file contains the HostID of your computer which will be needed when you fill out the form to request your license. If your myhostid.txt file does not open in Notepad, it will be in your GAUSS installation directory (e.g., c:\gauss18). Start GAUSS by either clicking on the desktop icon, or the start menu short-cut. Enter the applicable License Activation Key into the License Activation Window and follow the prompts. 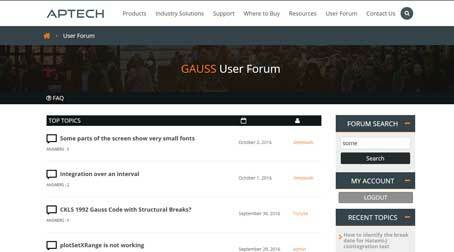 From from the main GAUSS menu bar, select Help > About GAUSS. Make the gauss19 folder on each computer. Place an empty myhostid.txt file in the gauss19 folder. To simplify the licensing process for multiple stand-alone computers, Aptech can create one license file that will work on each of your lab/site computers. Copy-and-paste each computer's HostID number into a single txt file and submit it with your License File Request.